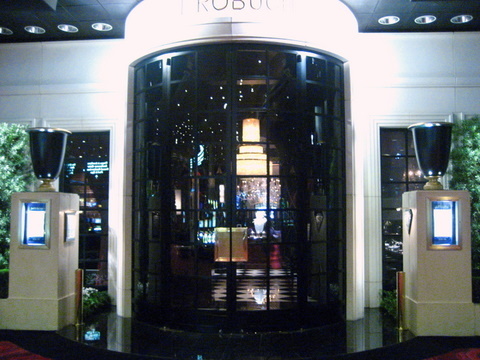 Situated in the Mansion at the MGM, Robuchon was the first of what I consider the ultra high-end restaurants, the others being Guy Savoy and Alex. 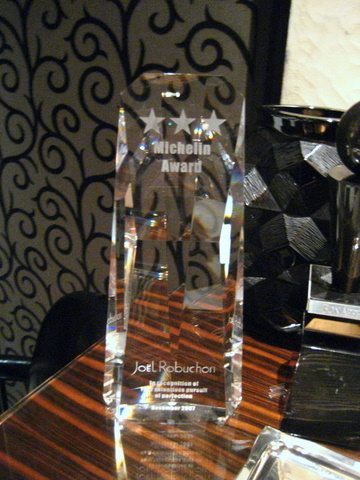 Without a doubt Robuchon is the most critically acclaimed restaurant in Las Vegas. The only 3-star restaurant in Vegas according to Michelin as well as the top rated restaurant on sites like Gayot and Zagat. It seems in recent years, Las Vegas has been making a concerted effort to transform from the land of buffets to a true center of culinary wonder. 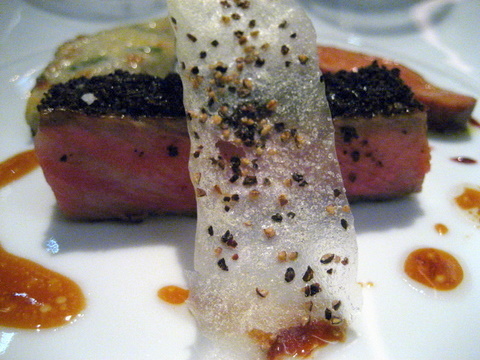 My previous experiences with the Vegas sites for some other top chefs has been mixed and I have made no secret of my disdain for these restaurants. So it was with some trepidation that I approached Robuchon, given the high cost a poor meal here would have added so much insult to injury. Fortunately the meal was a transcendent experience and ranks up there with the best meals of my life to date: French Laundry and Urasawa. Approach the temple of Gastronomy that is Robuchon, but be warned, once you have visited you may find your tastes changed forever. 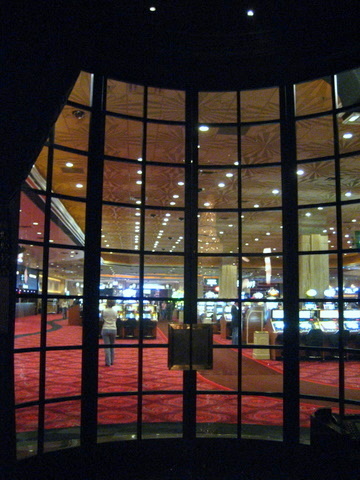 Upon entering the air seems to change, gone is the smoky oppressiveness and rancor of the casino floor. 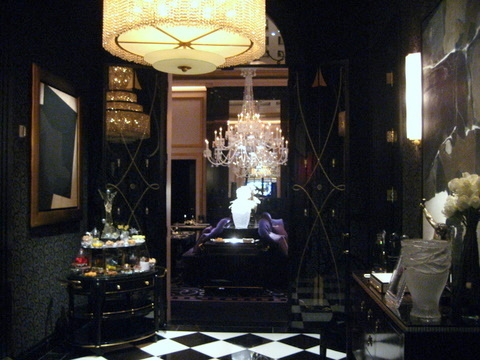 Once the doors close, it truly feels you are transported to a mansion where all manner of luxuries await. 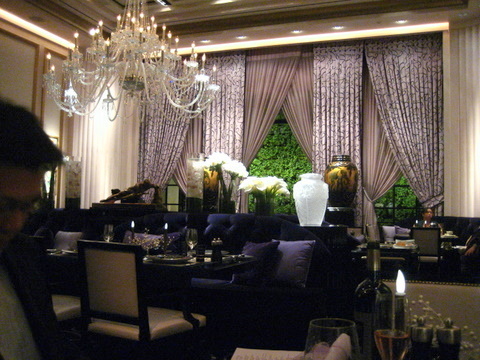 I found the dining room to be the height of decadence, plush purple sofas, a massive chandelier and various other artwork spaced about the room. 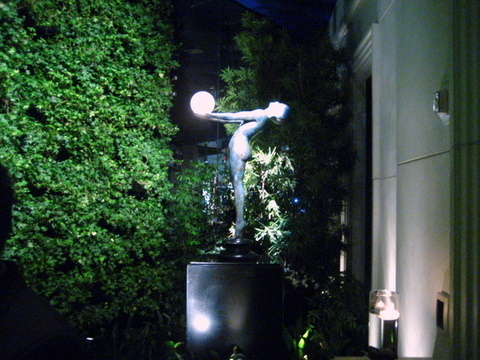 The restaurant even has a small faux-garden for those who wish to dine "outside." My only complaint is the restaurant is a touch to bright to evoke a sense of intimacy for those celebrating a special occasion. I can hardly remember a time when a meal didn't start with a cocktail and with a meal this momentous it would be criminal not to have one. 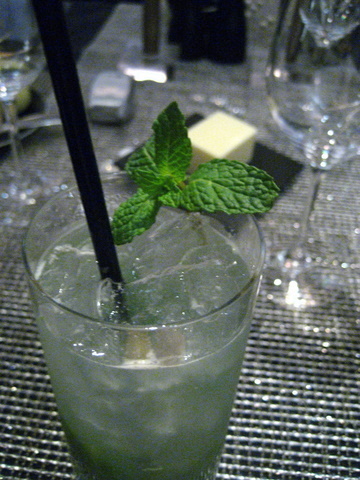 My companion started with his trademark mojito and I went with a pear martini. 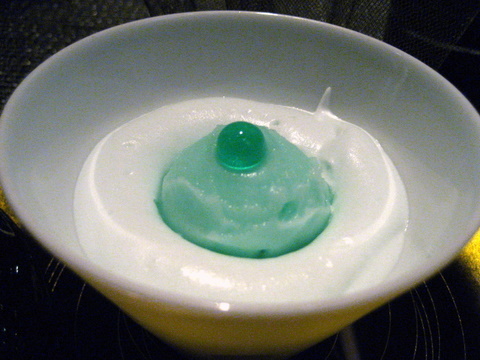 Ever since b-school I have picked up a thing for cucumber drinks... my first choice was a cucumber martini, sadly the bar didn't have the ingredients. 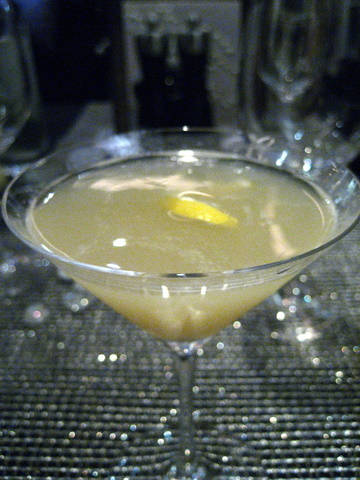 I thought the pear martini was quite good but I was saddened to hear I couldn't have my first choice. 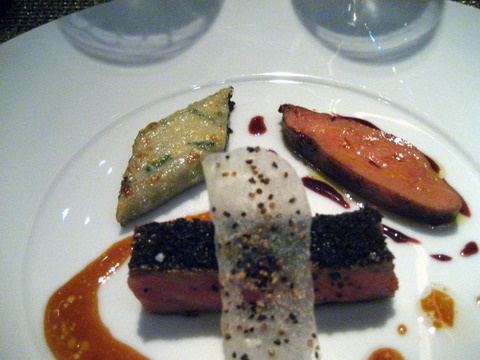 A meal as elaborate as the one at Robuchon practically screams wine pairing. Sadly Robuchon doesn't offer wine pairings so we purchased a few of the more reasonable bottles. We had considered bringing our own but found the $100 corkage prohibitive for all but the most expensive bottles. Bruno Paillard 'Brut Rosé Première Cuvée', Reims, NV: Fairly light in color for a Rosé, the nose leads with light hints of young fruit with some minerality. On the palette the wine is light and acidic a nice way to start a meal. Dr. Bernkasteler Badstube, Mosel-Saar-Ruwer, Wegeler, 2004: The very definition of off-dry. This wine had classic flavors of orchard fruit and minerals with an edge of acidity. Shafer Merlot, Napa Valley, 2004: A very straightforward wine, intense flavors of ripe fruit, very uniform and easy drinking. I tend to shy away from merlot but this was very approachable. Domaine Alain Brumont, Pacherenc du Vic Bihl 'Brumaire', 2004: I was leaning towards a Sauternes for dessert but having never had a Pacherenc before decided to try this instead. I detected aromas of ripe apricot and necatrines and a hint of spice, a highly concentrated palette and lingering finish round out this wine. 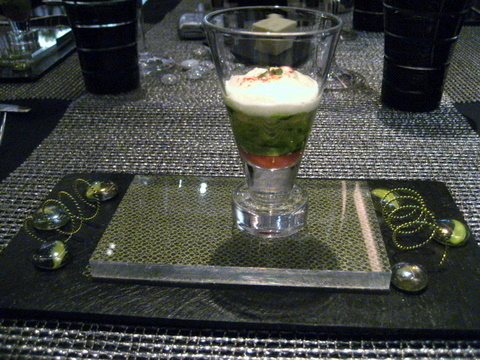 The amuse consisted of layers of flavors centered around avocado puree. 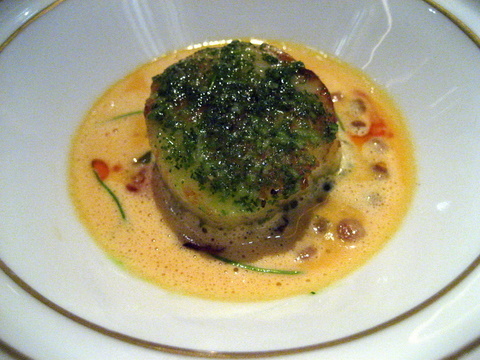 The base layer was a tomato puree that added an intensely tart aspect to the flavor. The rich earthy cheese also paired well with sweet creamy avocado. The flavors and soft textures were nicely contrasted with bits of crisp fresh apple. Easily the largest most elaborate bread cart I have ever seen. 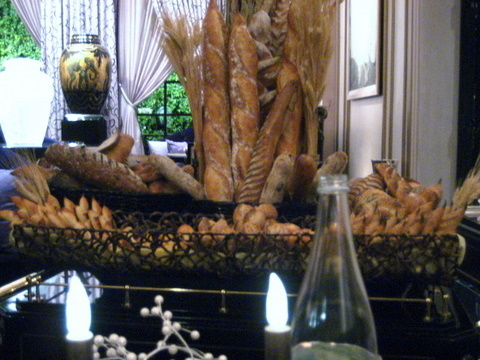 I could try each and every bread and be full. 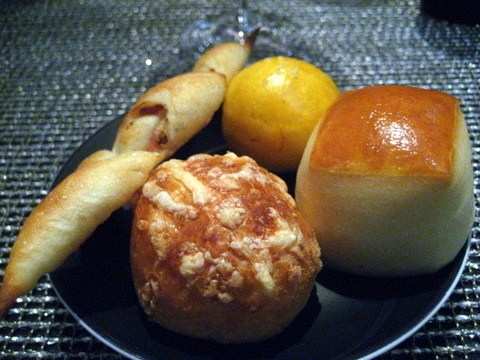 My dining companions and I each sampled four breads. 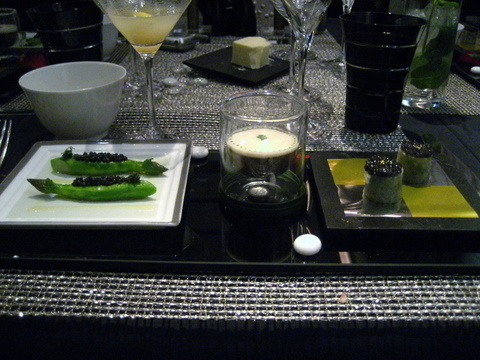 The second course was a study in caviar. 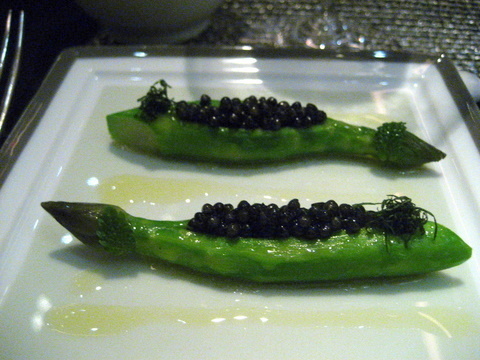 The first presentation was asparagus topped with caviar which I found to be a bit disappointing as the caviar flavors were masked. 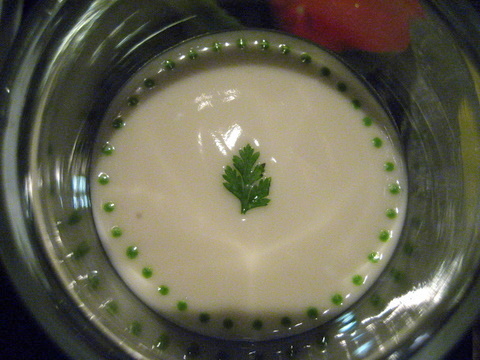 The second was a lobster gelee and caviar topped with cauliflower cream. 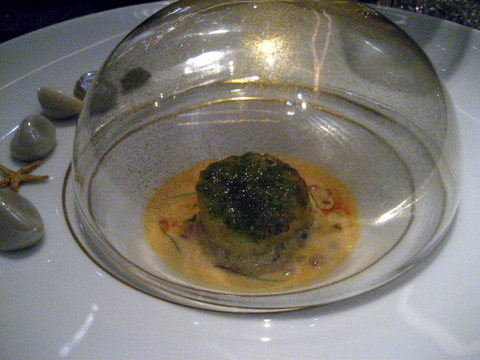 I found this more to my liking with the richness of the lobster pairing nicely with the briney nuttiness of the caviar. 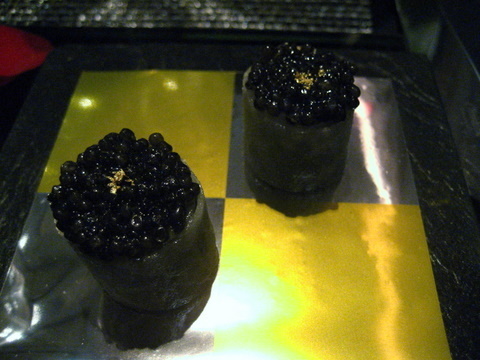 The final dish of the trio was "Caviar Sushi," oscetra caviar atop gritty cous cous wrapped with a thin slice of cucumber. This was my favorite presentation as it allowed the flavor of the caviar to come to the fore while pairing different textures. Maybe the best scallop I have ever had. 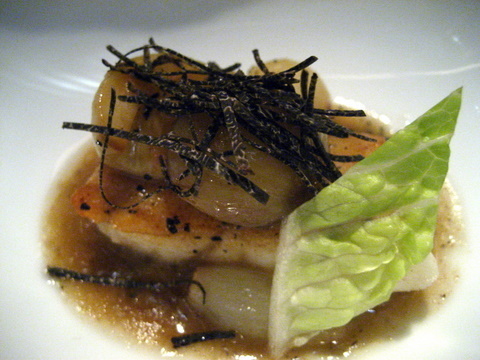 This jumbo scallop was perfectly prepared with a slightly firm yet delicate texture throughout. The sauce leaned towards Asian flavors with hints of coconut milk and ginger. This was balanced out with a buttery toffee flavor although where the coral was in all this I am not sure. 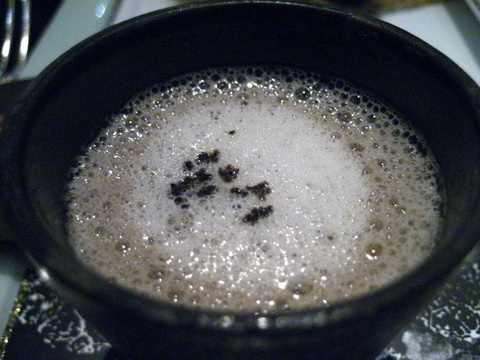 Rounding out the dish were little beads of pasta somewhat reminscent of tapioca pearls with a much rougher texture. 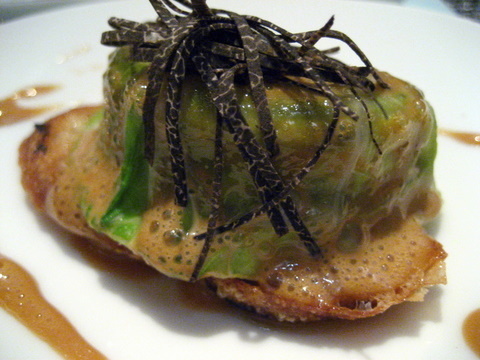 A signature dish of Robuchon and seemingly a staple at many high-end traditional French restaurants. I have never been that impressed, until now. The langoustine was perfectly cooked and maintained a semi-transparent color and a firm snap upon mastication. The earthy truffle and slightly sweet buttery cabbage were the perfect accompaniments. 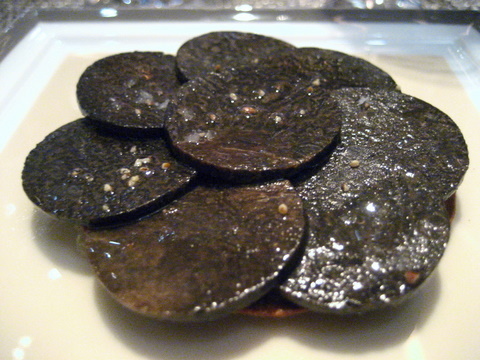 Another study of a single ingredient this time the luxurious black truffle. First a "Truffle Pizza," thick slices of truffle atop a crisp tart sandwiching onions and smoked ham. I tried a truffle slice by itself and found it somewhat disappointing, however when eaten together the flavors of the ham and onions brought out the elegance of the truffle. 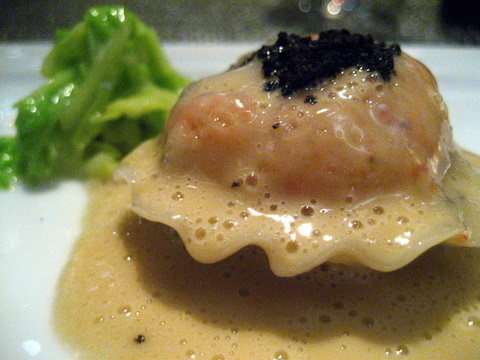 The ravioli consisted of crisp lettuce wraped around foie gras, the flavor is hard to describe, but quite good. The truffle cream on custard was definitely the most complex. 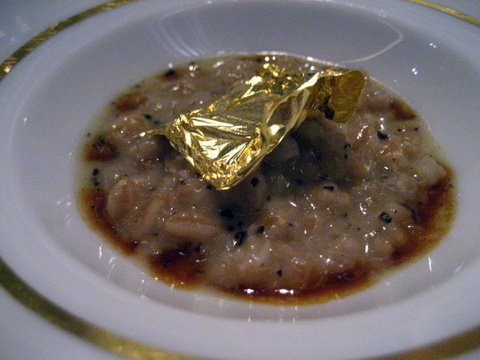 A delicate hint of truffle combined with a complex slightly bitter vegetable custard. An interesting presentation of abalone, sliced paper-thin the texture was silky smooth and otherworldly, the flavor however was missing. 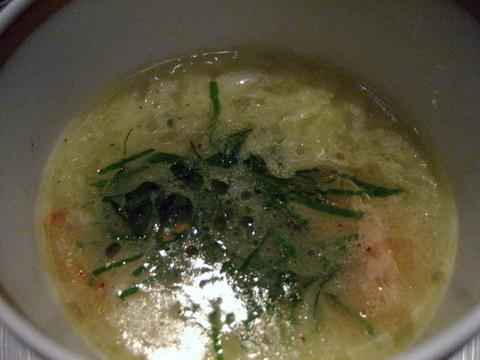 The bouillon itself had aromas of ginger, for some reason the flavor reminded me of homecooked noodles with oyster sauce. Not a bad thing but not what I was looking for. 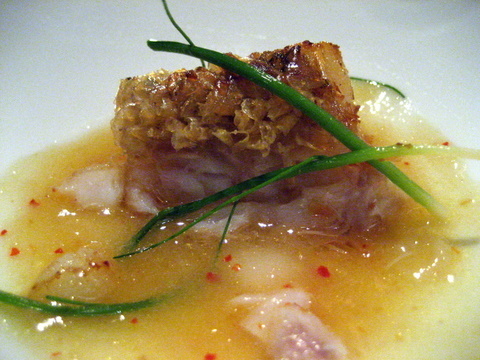 One of the best presentation of cooked fish I have ever had the pleasure of enjoying. 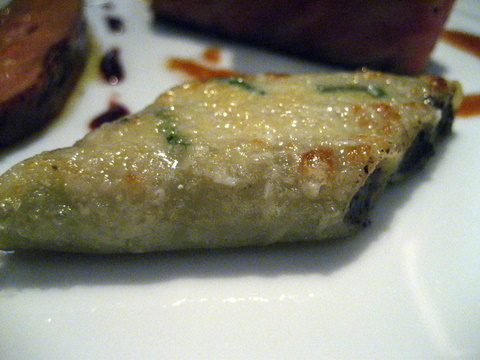 One's attention is immediately drawn to the semi-transparent fried skin. The fish itself was soft in texture and light in flavor the skin however had a delicate crunch and a slightly burnt flavor that contrasted perfectly. The sauce imparted the citrusy tang of yuzu which fairly trickled down the throat and left a pleasant tingling in its wake. A heavier fish than the Amadai, but not so much that I found it dense. 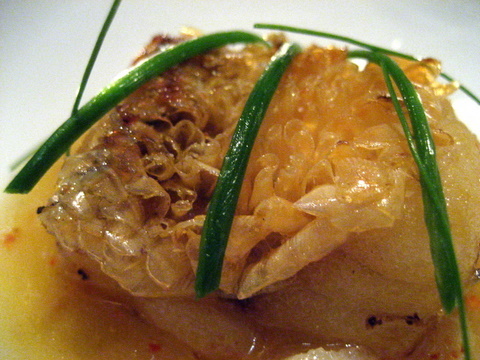 The turbot had a fragrant sweetness from the onions and chestnuts yet also a salty buttery savoriness. A nice cut of Kobe, cooked perfectly with a warm rare center and a well cooked exterior. The meat did not have the intense fattiness I tasted in Japan, but was still respectable. Eating the beef alone I swear I almost tasted maggie sauce. I enjoyed the beef most paired with the crunchy bite of the black pepper cristalline. The macaroni was a bit undercooked for my taste but the rich cheese filling made up for that. 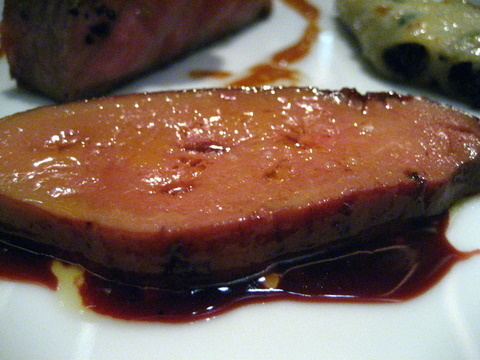 The foie gras was a delicious if standard preparation, soft and fatty but nothing particularly noteworthy. My second experience with farro grain, the first being at Craft Los Angeles. Both times I was served a truffle flavored risotto style farro dish and both times I found the grain a bit rough, perhaps because part of the hull is still attached. I prefer the smooth chewy texture of Aborio rice to Farro grain. Think of the comparison between white and brown rice. 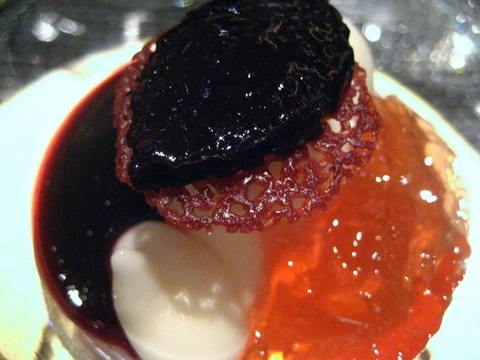 A complex and delicious dessert with its various components taken individually or together. By this point I was quite tipsy and my notes seem to blur. I remember everything but the pair being fairly sweet. The second dessert was a lovely chocolate cake resting under a layer of delicate mint sorbet. The consensus at the table was this tasted a lot like mint chocolate chip ice cream. 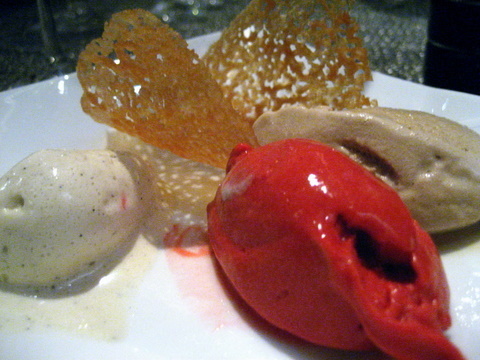 A trio of housemade ice creams, all quite good, my favorite being the raspberry sorbet. Start strong finish strong. 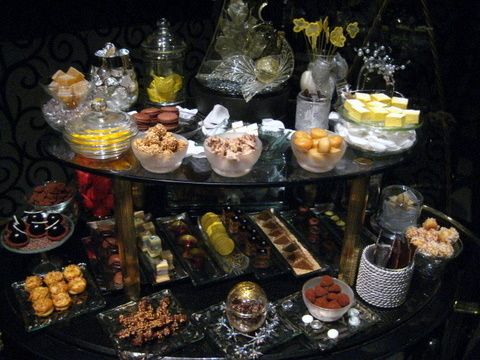 Remember that bread cart from the beginning, well the mignardises cart was just as extravagant. I wanted to try everything but thought it would look bad if I asked for one of everything, maybe next time. 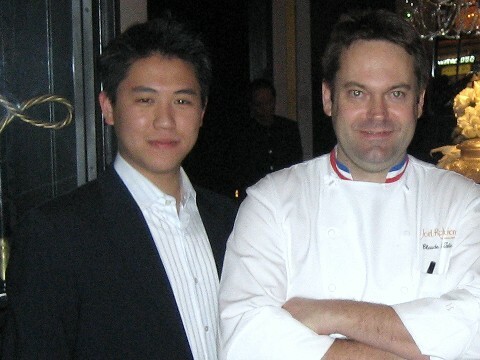 Robuchon does not run his eponymous restaurant, that duty is left to Executive Chef Claude le Tohic who was gracious enough to come out and pose for pictures with us. Given we had a 9:00 reservation it should come as no surprise we were the last diners to leave the restaurant. 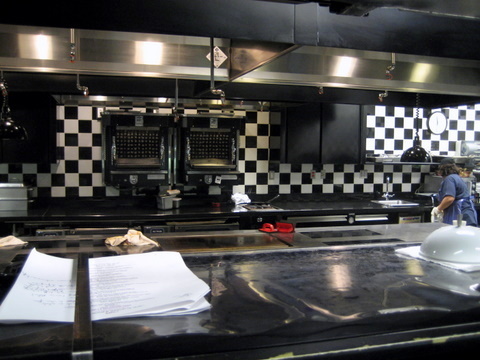 Prior to our departure we requested and were granted a tour of the kitchen. 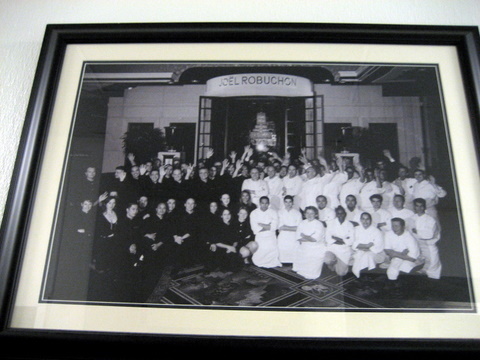 Upon entering one is greeted by a black and white photo of the staff on opening day. 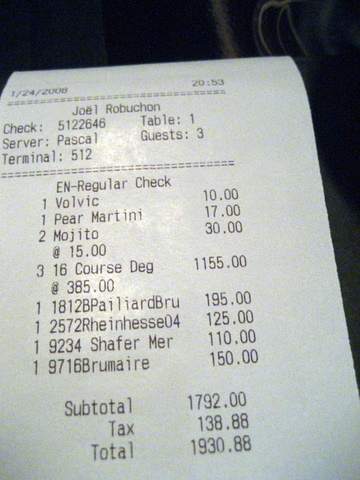 The last bit of unpleasantness before leaving, the bill... largest yet, $775 per person after tip. 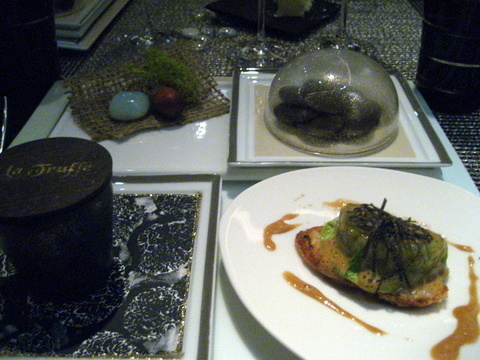 Robuchon singlehandedly changed my opinion of Las Vegas dining. Yes I do still believe the Las Vegas branches of restaurant empires are the redheaded stepchildren. 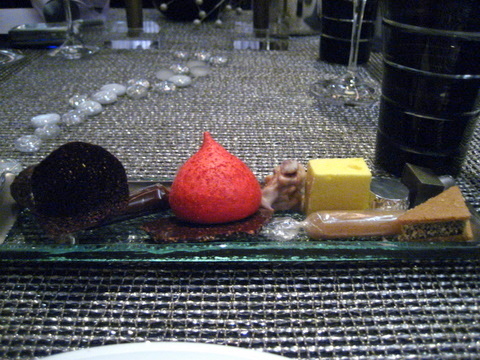 That does not mean one cannot find good food in Vegas, and Robuchon is nothing less than the best. The restaurant truly deserves all its accolades. If I had one complaint it is that the food is a bit uniform, notice the number of dishes using truffle and the heavy use of butter. On the one hand I happen to love the flavors presented to me, on the other hand part of me wonders why so many dishes taste the same. The way I see it, this thought didn't even occur to me until well after the meal. The food was good enough when I ate it, it is good enough now.